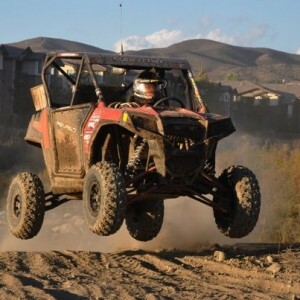 CODY RAHDERS DRIVES RZR 570 FOR THE WIN Driving his RZR 570, Cody Rahders finished first in the Lake Elsinore Grand Prix. Even more impressive-- he finished 2.5 minutes ahead of his nearest competitor. Cody raced in the 855cc class with his Alba Racing built 570cc engine. This was the smallest engine in the class. Cody Rahders finished 5th overall of the 42 participants.